Aratakara like to go to have our cars washed. 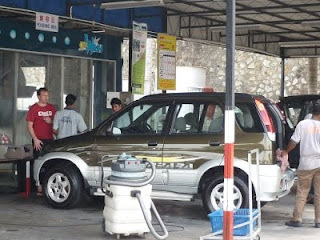 They always want to go to "Cuci kereta", "Wash car" in Malay, when we drive past the petrol station near Island Plaza. It costs only 3RM (0.60GBP). It's done by manpower first, more than 6 men surround the car with brushes, sponges and water hoses, proceeding to the automatic car wash booth, then finished off with another 2 men drying the car with cloth in both hands. While the car is being washed, we stay inside and it must be fun for boys! Of course, cars are sparkling clean after that. I bought my Kembara in January. Since then, I haven't clean the inside and I've found a couple of dried-up bodies of cockroaches! So we decided to have the inside cleaned as well. They washed the floor mats, vacuumed the floor and chairs, then wiped the dashboard and the handle. It cost extra 5RM (1GBP). Well, if it's so cheap, I should have done it more often! Last week, we also went to have the puncture in a tyre fixed. It was only 5RM as well. Even if they've charged us 50RM, we wouldn't have had any doubt and paid!